A woman of noble Arabian family; married about 75 B.C. the Jewish governor Antipater, to whom she bore five children, Phasaelus, Herod (afterward king), Josephus, Pheroras, and Salome (Josephus, "Ant." xiv. 7, § 3; idem, "B. J." i. 8, § 9). Once when Herod had to go to Augustus, he gave his mother, Cypros, and his sister into the care of his brother Pheroras, and had them taken to Masada ("Ant." xv. 6, § 5); but his wife Mariamne and the latter's mother, who looked down haughtily upon Herod's mother and sister ("B. J." i. 22, § 3), had to be sent to a different place. Kappaύπρις ("Cypris") is found as a variant of Kappaύπρος. 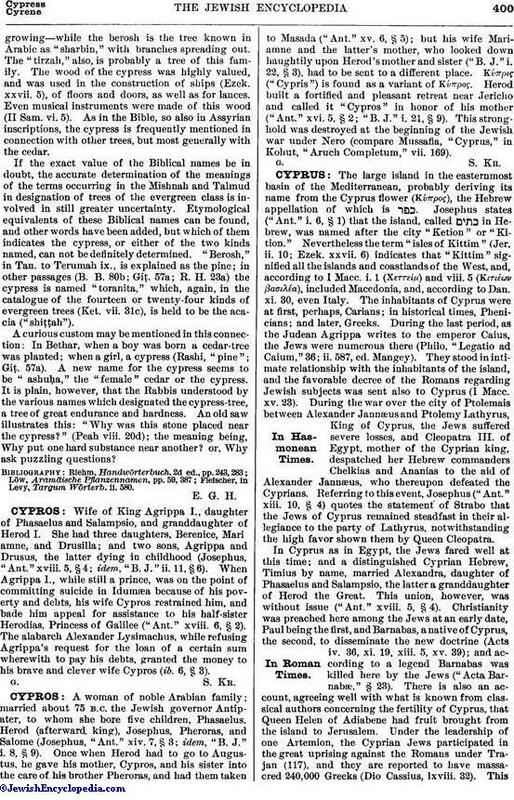 Herod built a fortified and pleasant retreat near Jericho and called it "Cypros" in honor of his mother ("Ant." xvi. 5, § 2; "B. J." i. 21, § 9). This stronghold was destroyed at the beginning of the Jewish war under Nero (compare Mussafia, "Cyprus," in Kohut, "Aruch Completum," vii. 169).